Note: Old unlock files still work, and now Noaika pre-order files will unlock Eroico as well. I will be updating DLsite's version soon, though it's codes work with this too. - Window no longer automatically centers or resizes in most cases. - Fixed issue where controller stops working on Alt-tab. - Fixed issue where difficulty only changes if you press start. - Fixed issue where witch CG shows with adult-content off. Ghost-chan doesn't forgive, doesn't forget. There are over 9000 sexually-deprived ghosts. I'm curious, why you reworked on this game if it was finished, instead of working on a new project or even a sequel (since the characters are the same)? Manga Gamer and Nutaku both want to sell my old games, and I simply didn't feel comfortable selling them in the state they were in. Eroico's main problem was that the animations were just lazy, in addition to the bugs. Oh Victor, don't tease me with the prospect of an Eroico sequel. I couldn't stand the heartbreak over not getting one. I could swear I saw the screen fade to black for a quarter of a second shortly after restarting the first level, but it was so short it may just have been my brain playing tricks on me after I blinked. Also, not really a bug, but it's possible to use that OP spinny-slashy move to gain height on the last boss, bouncing off her repeatedly up to the point where you're off-screen above her. I stayed there during a whole "blue balls" segment, continually bouncing off of her head and dealing an awful lot of damage. Not sure if that's intended to be possible or not. I'm starting to miss the cool main menu text, too, but I guess the placeholder does the job. I always loved this game, but that revision is fantastic. Black fade out thing has been around for a while. I've fixed it so it will be in the next version. Spinny slashy move is indeed OP on the last boss. Cool main menu text was removed because it didn't match the overall style, in my opinion. But the way, I didn't tested it with version 5, but I have a weird game crash during Tree Boss encounter in gallery mode with version 4. Usually it happens right after final flower attack phase. I can avoid a crash only if I can deal enough damage to tree. Everything is fine after it transforms. Does it give you an error message? I can't get that to happen in V5, at least. I just tested it with version 5 and I can't get that to happen either. Problem solved, heh. PS: Waiting patiently for Noaika. No, it isn't. I'll fix it in the next version. Oh, I'm glad i noticed this. Checked V6 just now and saw you fixed it already, thanks. I wanted to ask you, just curious. How can you describe this project: update, remaster or remake? Well, it isn't just an update and it isnt a total remake, so thats what I called it a revision. Most stuff was just updated, but many of the H animations were remade. I see. Well, updated H-animations alone were worth it to me. I'm getting a really annoying bug with the sound. It's like...all static and stuff. I've reported a similar problem in his previous post (Eroico V4) but Kyrieru doesn't seems to know what could cause this problem unfortunately. I just figured out the problem!!!!!!!!!!!!!!! It's a particularly easy fix. The problem is the default sound format. I usually have it set at 24 bit 192000hz. Upon setting it to 24 bit 44100hz however, the static is completely gone. Seems Eroico doesn't like higher quality sound output. Interesting, I also have my audio quality set to 24bit 192000hz, so that might be what is causing the problem. I've run into problems because of running weird sample rates before, so that's where I'd start. You should look into drivers, or see if the software side of your sound card has it's own settings. In GM, I down-sample sounds to save space, but it would be a big compromise to change that. Hopefully it's due to the way GM is playing sounds and not the sample rate. I also tried to switch to the onboard soundcard of my motherboard to see if I can do a test with it. Well, guess what, it doesn't work. Drivers for it has been updated for Win10, so it should work but apparently, when I remove my sound card from my computer, Win10 doesn't even detect the onboard soundcard anymore. So, there is definitily somthing wrong with my setup. Anyway, don't worry about me, I'm gonna do a fresh install of Win10 at the end on the week. I'm pretty sure it will fix my issue, since there was no problem when I switched to Win10 back then, so it's probably somthing I tweaked or modified that has caused this problem. But since I don't know what exactly, I prefer to do a fresh install, at least if something goes wrong during the process of the reinstallation all my softwares, it will easier for me to found out what is causing the problem. Okay, so I've reinstalled Win10 and everything work as it supposed to now. So, it was an issue on my end but I still don't know what exactly caused this problem. But hey, it works now, so who cares. Now that I can switch to 24 bit 44100hz and play to Eroico RE without any issue, I can definitly tell you that you did really good job with the revision of the animations! I bought Noaika long time ago. so, what is difference with full version and demo version? I put your file at same place with demo file. And than, I reached at second save point and it was block. Am I playing full version? or just demo version? Noaika isn't finished yet, the unlock code was from when I did pre-orders. Assuming that's that you are trying to play since there are no blocks at the second checkpoint in Eroico. Ugh, I must be really bad at platforming, I cannot get anywhere at all. Mind, I've completely cleared CptClaw, MMX8, Shantae and other casual platformers even on hard where applicable (also LAB, SACRED, Holyma, Punisher and RePure, from eroge side), but on this one I'm utterly stuck. At least really unpassable for me parts (wall-to wall electric hell) in Kurovadis were entirely optional. I don't suppose you could add some measure of cheat function or something else to help those of us that are on the casual side of things in platformers? A double-jump that can be repeated after slash-jump would be perfect. Easy-mode only, of course. In Eroico, there are now additional blocks on Normal and loads and loads of additional blocks on Easy. These create additional platforms and replace traps with solid ground. On Easy, the platforming sections should be beyond trivial... perhaps even easier than Shantae's, if that's even possible. Huh, it seems you're right. Belay that, sorry for making an issue. Made a seamless, deathless run in 'bout a hour. Shantae even a paraplegic can beat. While asleep. Unless he dies from boredom or something. Nah, it was a one time thing. Gah, that image made by the artist is so cute. Praise checkpoint loli! I wish we could just attack her while she's on the checkpoints too. Btw, that thing with the vampire was just aone time thing it seems. It's all clear now with these updates. Thanks for the all the hard work keeping your games well maintenance, I can't wait for Noaika! Oh and, I remember you set a goal for yourself last year, why not this year? you said the pre-order code works now...you mean you can play eroico with the noaika preorder code instead of buying eroico code? Yep. Anyone who bought Noaika gets anything I make for free until it's done. Well I'll be damned. I didn't think it would include Eroico since that game was released before the Noaika preorders, and what has been released since then is technically just an update (as nice of an update as it is). But it's true, I just unpacked a fresh copy of the V6 version to try my noaika unlock file with it, and it worked. So people who preordered Noaika actually get all of Eroico for free even if they never bought it. I already owned it, but still, that's awesome. I notice that when I quickly descend or ascend a lot of enemies can become displaced. Usually ending up on a platform below the one they were standing on. Also, I found kind of a minor little bug. Nothing big really. If you are downed for any reason while fighting a boss, such as by pressing "H", a little heart appears over their heads. Enemies being displaced from the environment is sort of a semi-common bug in platformers. It usually happens when you have performance issues that cause the platforms and enemies to move at slightly different speeds, sometimes displacing the enemies just enough that they fall through the ground. Not sure if this applies here though, I've never seen this bug occur in Eroico and neither did I see it in any of the Let's Play videos I saw on it. When the character is knocked down, even boulders produce a little heart. It's a thing. It's typically not an issue with bosses because they can't knock you down and their H scenes only occur after you've been fully defeated, so you wouldn't see it happen unless you manually pressed H.
In the immediate I'd look into improving performance (making sure that there aren't a million programs using the CPU and RAM in the background); that might eliminate your displacement issues. In all likelihood that bug is because I changed the way stuff is activated and deactivated. Before, things would constantly activate/deactivate when they are outside the view. However, I changed it so that it only does it once you'd traveled a certain distance. Because there aren't a lot of fall through platforms OR vertical movement in Eroico, it just hasn't had the testing conditions it'd need to happen frequently. So this isn't so much about Eroico as it it is Kurovadis, but for whatever reason the same controller doesn't work across both games. As far as I can tell, Kurovadis wants you to use a joystick (something my pad doesn't have) and wont accept D-pad inputs. For that matter, Noaika functions the same as Eroico so Kurovadis is the odd one out. Just thought you should know, if you didn't already that is. I love your games and animations, please keep up the great work Kyrieru. "Monster Girls" Any previews for this project? Wow, you did an impressive job with this remake. I really like the new animations, it feels like they're all at least at the same level that the old harpy one was plus that extra animation for cuming. It feels like a well done HD remake of the game. Good luck with your other projects. As impressive as this is, I don't think you should feel like you need this level of quality in everything you release. At least not in the first version? Oh yes, and the new generic game over screen is hilarious. Idk if someone already asked this question, but if you decided to work on this game again (in the unforeseeable future), what would Ghost girl's H-animation be like? Oh, and how would she attack you (assuming simply bumping into you is not her attack)? Iunno. Somethin to do with possession probably. Apparently there's a bug where you can pick up a health powerup after losing all your health, which gives you health back but doesn't get rid of the fact that you lost it all in the first place so your only choice is to go back to the menu. Also, didn't the guy in the HUD have unused sprites that you mentioned earlier? If you haven't figured it out already I can tell you what triggers the bug for some players where the cgi screens are zoomed in and only show parts of the picture. This happens on computers with relatively high resolutions (1920x1080 etc) compared to physical screen size. Windows will automatically upscale some programs in an effort to make text more readable. Players can fix this bug themselves by going to compatibility settings for eroico_re.exe and check the box labeled "Disable display scaling on high DPI settings". For full screen programs there are no reason to have display scaling activated because you'll just make parts of the picture go outside the screen. In Eroico i suspect many players won't realize they have this problem as the cgi's look surprisingly normal even when zoomed in despite parts of the picture, including continue/exit, not being visible. I recommend shipping an exe with that compatibility setting activated by default or see if gamemaker has some native feature to make windows ignore DPI upscaling. Also, as another user pointed out there is a bug (tested on Revision V6 demo version) where if you pick up a hearth after you died the game will let you continue but without music playing and with the spell system broken (all mana gone and you can't pick up more). Where/how do I pre-order Noaika? It was a one time thing, it can't be pre-ordered now. Damn. Feelsbadman. Still can't wait for release. I'd love to post fan-art. Your designs are amaze! so what does the future hold? what can we expect to see from you next? Noaika maybe?? So will we one day actually get new stuff from you, or are one-off sprite animations and rehashing old stuff what's to expect? I would gladly Patreon if you gave me any inclination that you're actually going to produce content, but by this point, since Noaika's initial announcement and now, you've produced literally nothing. It's become something of a running gag in my small circle that Kyrieru is the dev that produces extremely high quality non-content. Kyrieru has multiple irons in the fire. 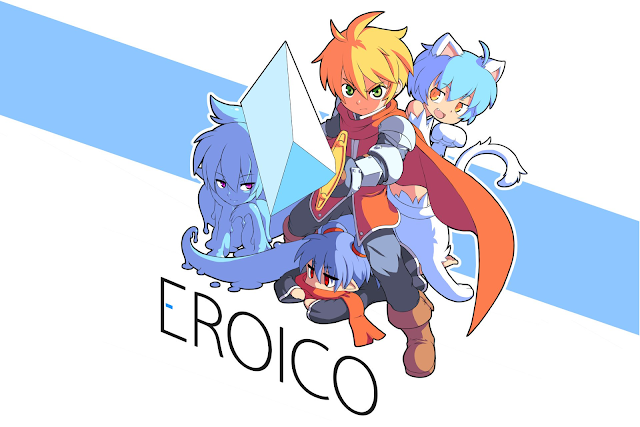 Eroico will be selling on both MangaGamer and Nutaku, which is why it needed to be brought up to standard ASAP. Last we heard, the overall plan is to release smaller stuff first; there are a few small games that could be completed relatively quickly and which, combined with re-releases, should get any financial concerns entirely out of the way. Then Kyrieru will be able to put 100% focus into Noaika; this is important because Noaika will be a big game and Kyrieru will of course want it to be of high quality. Big game companies are all about hype and releasing disappointing products. Kyrieru does the opposite: absolutely no news for a very long time, and then a really nice product that no one still expected. Plus, as much as I'm looking forward to play Noaika, I get all games free until it's released, so I don't mind so much if it gets released a bit later. loved the first but this one... wow. be able to make a "UNLOCK ALL" Slot, you tried to explain it, but it seems i cannot get it to work. could you maybe make one for me? Hey, just picked this up, and I'm noticing a major issue with the framerate. The game barely runs in either full screen or windowed. Is this a known issue? Download the latest one (click Eroico in the links at the top). I sped up the game a little bit. Other than that, some people have had weird speed issues with GM games involving controller emulators, or sometimes by restarting their pcs. Unfortunatly there are some incompatibilities I can't solve for.